Ironically yesterday I reviewed a book co-authored by Adrian Berry (Peak Bouldering by Rockfax), and today I am reviewing one with a picture on the front cover of his ex-business partner (planetFear), Shane Ohly! Small old world. 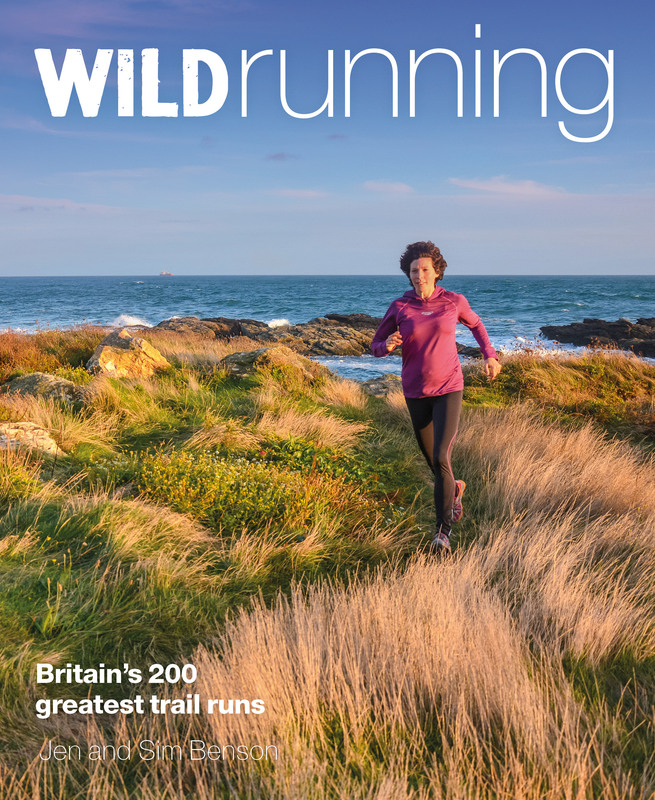 Wild Running is another publication by Daniel Start, responsible for a series of similar format books on Wild Swimming, which I have reviewed over the past 5 or so years. Daniel seems to have hit upon a rich vein of inspiration and is turning out some lovely books which remind us to make the extra effort and get out there into the wild. We may not have the scope of America’s National parks or the Australian Outback, and it may be only a few miles to the nearest road from most points in the British Isles, but if you are on foot, heading off the beaten track can very easily and very quickly deliver you to some pretty wild places. Judging by the order in which these books have been produced Daniel himself is more of a swimmer than a runner so he has enlisted Jen and Sim Benson to actually write this volume, and they’ve done an excellent job as far as I am concerned. Despite the name of the book it’s really nice to see such groups as Urban escapes and Families in there too. There’s a nice introduction by Jen and Sim, with plenty of hints about running in the wild if it’s something that you haven’t done a great deal of before. As usual with Daniel’s books the photography is top notch. The book is crammed with decent quality photos inspiring me to want to get out there and run! Each photo has a discrete number overlaid on it which cross references with the run number in the book which obviously helps you identify a particular landscape / shot. Once you’ve identified a run that you fancy trying it’s a case of transferring the above info to a piece of paper (or your head! ), sourcing a map and compass, familiarising yourself with the route, getting yourself to the start, and heading off on your own two feet. For the technically minded you may want to upload the GPX file to your device, but I and the book would always recommend that you also take a map and compass for obvious reasons. 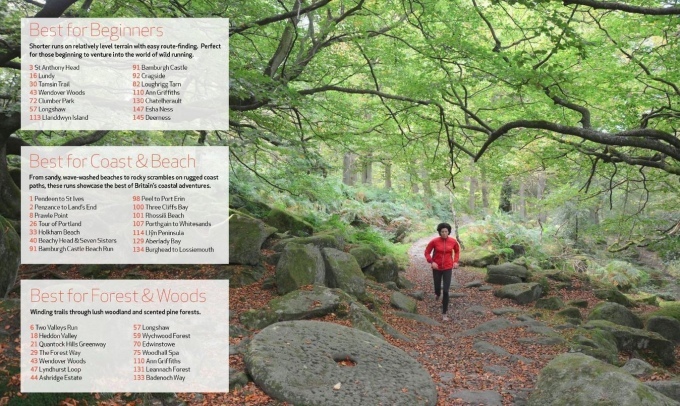 The descriptions in the book are very brief, meaning that you really do need to spend time working the route out on a map, and possibly on the Wild Running website (sounds obvious, but make sure you don’t rely on there being a mobile phone signal at the start of the route or on the route itself. My major gripe is akin to my comments about the Wild Swimming books and that is the lack of cross referencing – or rather the amount of cross referencing needed in order to, for example, match a route with a photo. I don’t understand why page numbers have not been employed more liberally to help this. Even the initial index has the routes listed by run number and not page number which means you then need to flick through the pages following the run numbers to get to where you want to go. Ditto the regional chapter pages. Having just reviewed a Rockfax guide yesterday I would suggest that some of their practices are employed. That said, that’s my only complaint, and it’s certainly not a show stopper. In terms of suggestions for further editions I’d say a starred system could be useful, Strava segments for the entire runs (some of which may well exist already of course), and perhaps QR codes as well as web addresses to link to the digital world. The obvious one is to turn the book into an App too. A fantastic new book which opens up a whole new world of possibilities. Probably as ground breaking as the initial Wild Swimming book, but all the more obvious as thousands of people are already partaking in Wild Running. Priced at £16.99 it’s an absolute bargain and should be on every runner’s bookshelves.